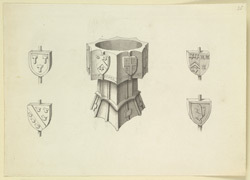 A drawing of the octagonal stone font in the church of Bolton-by-Bowland or West Bolton in Yorkshire (now in Lancashire), with details of the heraldic shields. The font is in the Gothic Perpendicular style and the bowl is octagonal with concave sides. The stand is also concave sided. The bowl is decorated with coats of arms. An inscription on the font points to a date after 1507.